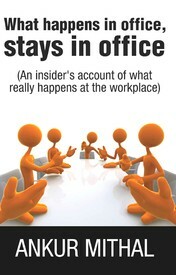 My book “What Happens in Office, Stays in Office” is now available online. The book is a satirical/humorous account of situations in a corporate environment created by the domineering boss, the whining employee, the counter-productive policy-making, the people jockeying for visibility, the decisions that get taken despite not being required, and many others. It is an extension of the theme followed in my blog darkofficehumour.wordpress.com. Thank you for your support to my blog. In case you get to reading the book, I hope you enjoy it. And, of course, I would love to get your feedback on it. Glad you liked it. Real life makes for the best stories. Congratulations. Writing a book and then getting someone to publish is monumental. You have made the top of the mountain. I am anxious to read it. Thank you Grumpa. I appreciate your support. Congratulations Ankur. I am an avid reader of your blogs & now also the owner of your book. Keep on writing, it is thoroughly enjoyable to go through your brief workplace day to day interactions & realities. Thanks Nauti. I value your support. Dear Ankur, Many many congratulations!!! Congratulations – i will order it on Amazon. I enjoy your posts immensely! Thanks a lot. As one of the early visitors to my blog, I appreciate and value your support. This is just amazing…but not surprising at all! Congratulations!!! Thank you Lopa. Feedback from readers of the blog has been a big support. Good luck with the book. You deserve to succeed. Hey! I didn’t know a book was coming 😀 … I’m ordering it right now 🙂 … So happy, I am! Oh great! I will check it out!